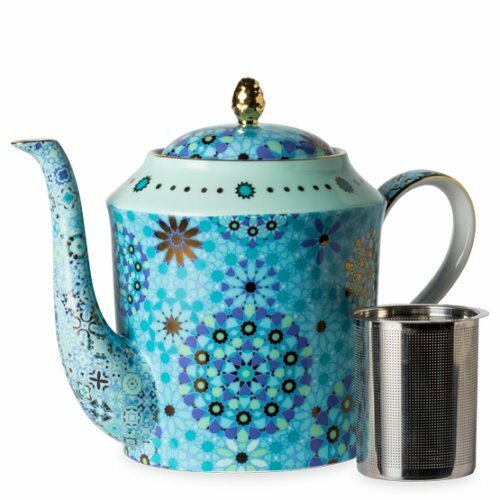 T2 Pimp My EMERALD - Fine Bone China TeaPot - 33.81oz • Material: Fine Bone China, Stainless steel infuser. • Gentle hand wash, NOT suitable for microwave or dishwasher • Pimp My Porcelain Teapot - What's better than one iconic T2 range? Three of them all rolled into one! Introducing Pimp My Tea - a super duper fusion of three all-time favourite T2 designs! Marigold Magic, Moroccan Tealeidoscope and Dazed & Dazzled join forces to create our biggest range ever. With three supercharged colour combos to get you inspired, we've got every shape covered - grab a tea for one or two, vibrant teapot, teacup and teamug in-between! Find your faves and amplify your tea cupboard with this larger-than-life tea set! If you have any questions about this product by T2 Pimp My EMERALD - Fine Bone China TeaPot - 33.81oz, contact us by completing and submitting the form below. If you are looking for a specif part number, please include it with your message.